Among the tens of thousands of historical photos that the Whistler Museum holds in our archives, I think Neal Carters’ are my favourites. 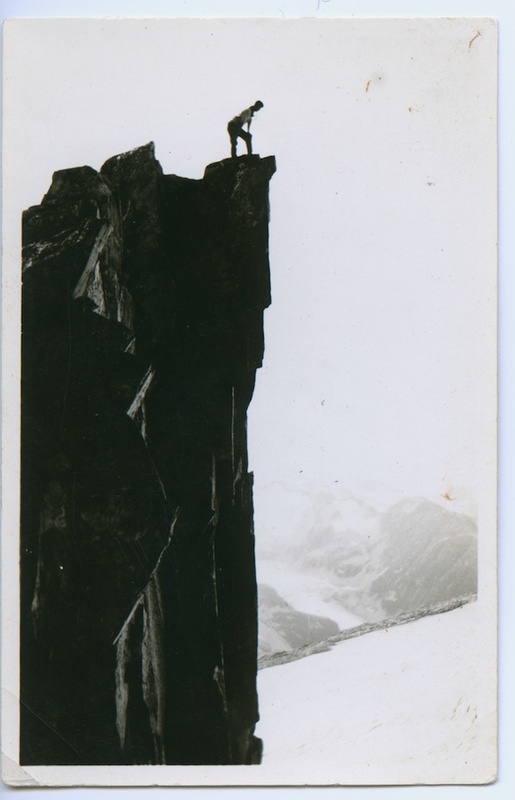 Carter was one of the most prolific mountaineers on the BC Coast during the 1920s and 1930s, gaining several first ascents. He also managed to turn his climbing hobby into a career, working as a surveyor first on hydro-survey crews around Garibaldi Lake, and then playing a major role in creating the first official topographic map of Garibaldi Park in 1928. The mountains immediately surrounding Whistler were of special interest to him. Not only did he personally map much of the area (original copies of his massive topo map are in the Vancouver City and BC Provincial Archives), he was also instrumental in convincing the Provincial Government to expand Garibaldi Park in 1928 to approximately its current boundaries, including the Spearhead Range and the Wedge groups of peaks. 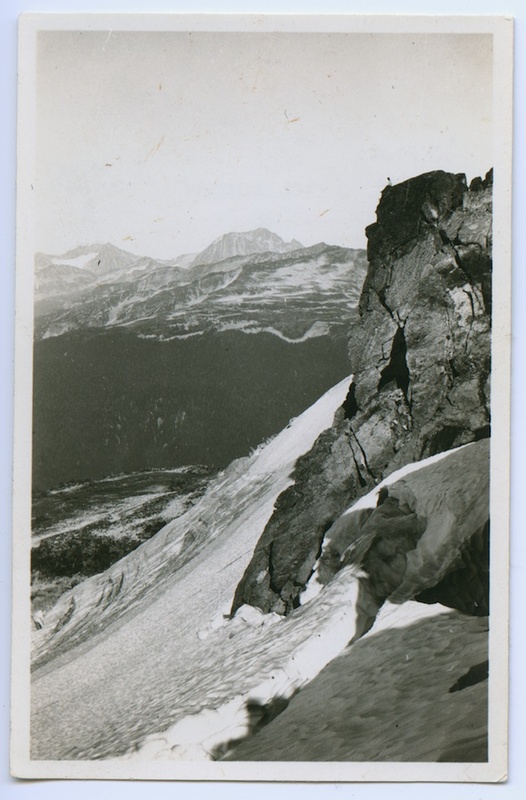 His first excursion into our local mountains occurred in September 1923 when he, along with fellow Vancouver climber Charles Townsend, spent two weeks bagging first ascents in the region. Beyond the sheer joy of two weeks climbing in such sublime terrain, the two were also on the lookout for potential sites for future BC Mountaineering Club summer camps, which had been held almost exclusively at Black Tusk Meadows for the last decade. 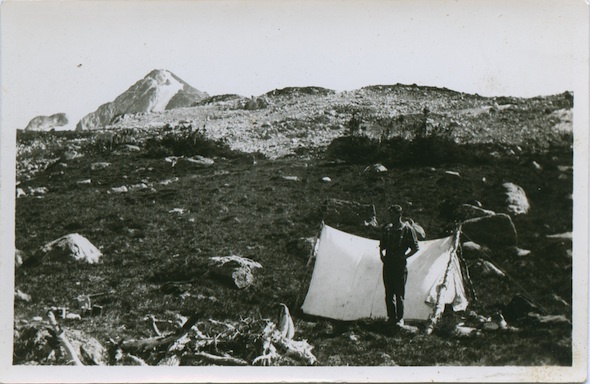 Their first night’s camp on the flanks of Wedge. Tent pole technology has come a long way in the last 88 years. Using Rainbow Lodge as their base (they gave Myrtle Philip copies of their photos from this trip, which is how the museum ended up with them) they first scrambled up Wedge Creek with a week’s worth of provisions. Carter’s very matter-of-fact account printed in the BC Mountaineer belies their huge, gruelling days of bushwacking, navigating crevasse mazes, and scrambling up terribly steep and loose talus slopes in uncharted terrain. The view south from Wedge to our familiar W-B backcountry: (l to r) Mounts Overlord, Pattison, Fissile, Trorey, Davidson, Castle Towers and Decker. They managed to bag the first ascents of the twin giants of Wedge Mountain and Mount James Turner (whose summit was almost too small to build a cairn), while surveying and naming many of the surrounding peaks and glaciers, over seven days. 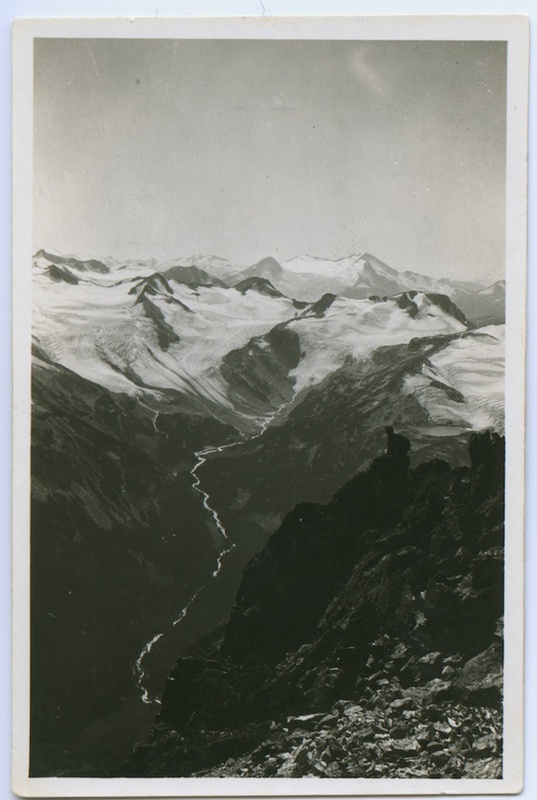 Along the way they were treated to remarkably clear conditions, which, combined with Carter’s substantial technical skills as a photographer (crucial for accurate topographic surveys), produced some striking images of the surrounding landscape. Getting radical near Mt. James Turner. Returning back to Rainbow Lodge, they revelled in a massive dinner and comfortable night’s sleep in a bed, but were back at it early the next morning heading for the “largely unexplored” Spearhead Range. 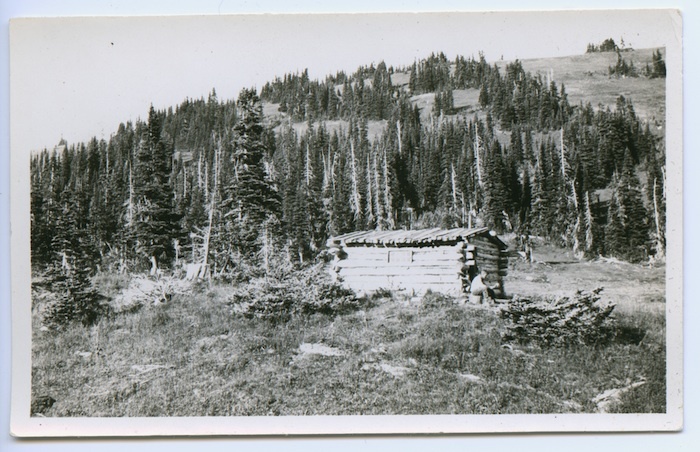 They first headed for Singing Pass-then known as “Avalanche Pass” and spent a night in the prospector’s cabin. The rest of that week was spent climbing surrounding peaks such as Fissile (then Red Mountain), Overlord, and a further excursion for the first ascents of Mount Angelo and Mount Diavolo, which they named for their contrasting appearances. Impressive solitude near Whistler’s peak. This is just a small sample from more than fifty photos in our collection that Carter produced over the two-week dream trip. Most of them are beautiful in their own right, but are just as interesting as a unique perspective on a landscape that has become some of the most-visited “backcountry” terrain in the province. Scanning through the images, you get a sense of Carter’s excitement and wonder as he peered out over vast expanse of completely undeveloped, largely unknown terrain. I dare anyone who’s lost their stoke and has begun to take our amazing surroundings for granted to come browse Carter’s photo albums and not get inspired. high drama… i wonder if you could pitch a photo essay of these images to a magazine like “beautiful bc” or “canadian geographic”? I think that is an awesome idea. Charles Townsend was also a very accomplished photographer who took over a hundred photos of his time in Vancouver.